Remenham means ‘Ravens’ Home’, possibly it was an area sacred to the chief Saxon god, Woden, whose symbol was the raven. The village has been very small since most of the population was wiped out by plague in 1664. It is most famous for its associations with rowing and, since 1839, especially with the Henley Royal Regatta and the Leander and Remenham Clubs. It sits on the Berkshire side of the Thames just across from that town and provides accommodation for spectators, judges and marshals during Regatta Week. The start of the course is at the Greek-style temple on Temple Island in Remenham. It was designed by James Wyatt in 1771 as a folly for Fawley Court, on the Henley side of the river. The old manor house stood near Remenham Farm where parts of the moat remain. This had been the refuge of Sir Edmund Montfort of Coleshill in Warwickshire during the reigns of Kings Edward IV and Richard III. He was a prominent Lancastrian and had been a good friend of Edward's rival, Henry VI, and therefore had all his manors except Remenham confiscated in 1474. The parish has a number of other fine country houses. Remenham Place was a preparatory school at the beginning of the 20th century and pupils included the ill-fated Antarctic explorer, Captain Oates. Culham Court (originally in Wargrave parish) was the home of the extravagant 5th Duke of Marlborough before he moved to Bill Hill. When King George III was entertained there, hot bread was specially brought, by horse relay, wrapped in flannels from his favourite baker’s in London. The King knew the area well, for he grew up at the most prominent mansion in the parish, Park Place, though the present French Renaissance style building almost completely dates from 1870. It was the chief country residence of the Frederick, the Prince of Wales, during the 1740s. There are paintings of his children hunting in the park and it is said they liked to play under the ‘King’s Cedar’. The Henley murderess, Mary Blandy, is said to have frequently met with her lover in the park. 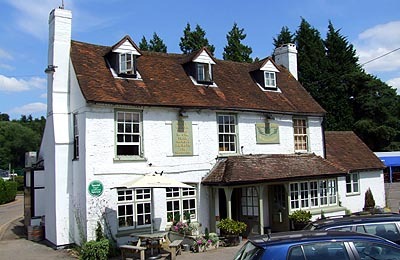 She certainly fled to the safety of the 'Little Angel' Inn in Remenham when pursued by the people of Henley. In 1752, the year of her execution, the estate was purchased by Field-Marshal Henry Seymour Conway, a former Governor of Jersey. As a token of their appreciation of his service, the people of Jersey gave him a Neolithic chambered tomb from the Mont de la Ville, near St. Helier, which he had shipped and re-erected at his Berkshire home as a romantic folly. He also brought stones from the ruins of Reading Abbey to build the ‘Ragged Arch’ (or Conway’s Bridge) beneath the traffic lights on the Henley to Wargrave road. Conway’s daughter, the sculptress Anne Seymour Damer, is associated with Henley Bridge where she designed the masks of the Thames and the Isis. Conway’s Lombardy Poplars were the first to be planted in England. Another extraordinary folly on the estate is the spire of St. Bride’s Church, Fleet Street which stands alone in a field. After being superseded in the city, it was brought here as a memorial to Queen Victoria’s accession to the throne. Remenham’s own church dates from the 13th century, but was almost entirely rebuilt in 1870. The apse is a rebuilding of a Norman predecessor. It is famous for its fine Siennese iron gates presented by John Noble of Park Place in 1875.